Fig.1: Noise figure Fa and noise temperature ta vs. frequency, per ITU-R. Noise figure (F) is a standard way of measuring the noise level of an RF system above thermal noise. The power equation for thermal noise is: Pn = kToB. then Pn = -174 dBm/Hz. This is the thermal noise power. (290°K = 17°C). Noise floor = (F + 10log10B - 174) dBm, where F (noise figure) is expressed in dB and B in Hz. HF reception, in the range 1.8 - 30 MHz, is often externally noise-limited due to galactic (sky), atmospheric and/or man-made noise. The curves in Fig.1 illustrate the effective contribution of these noise sources, expressed in dB above thermal noise. The Y-axis on the graph is usually specified as Fa, the noise figure (in dB relative to kToB), and is a measure of the external noise impinging on the antenna. The Y-axis can also be specified in terms of noise temperature ta. Fa = 52 - 23log10f where f = frequency in MHz. Fa = 66 - 47log10f where f = frequency in MHz. To ensure that it is always externally noise-limited, an HF receiver system, located at a quiet radio site and operating at the higher end of the HF range, should have F < 16 dB. This is equivalent to a -158 dBm/Hz noise floor or a sensitivity spec. of -113 dBm (0.5 µV) for 10 dB SINAD (equivalent to a -123 dBm noise floor) in a 3 kHz bandwidth. As can be seen from Fig.1, this is a limiting situation at HF, and in many cases, modest overall receiver system sensitivity can be tolerated without compromising system performance. It should be remarked, though, that additional receiver sensitivity is still useful to overcome losses in the antenna, feedline, preselector and so forth. CCIR (International Radio Consultative Committee), "Worldwide minimum external noise levels, 0.1 Hz to 100 GHz," CCIR Report 670, International Telecommunications Union, Geneva, Switzerland, 1990. "Radiowave Propagation", IEE EM Wave Series 30, Ch.3, L W Barclay G3HTF & M P M Hall ed., Peter Peregrinus Ltd., 1991. 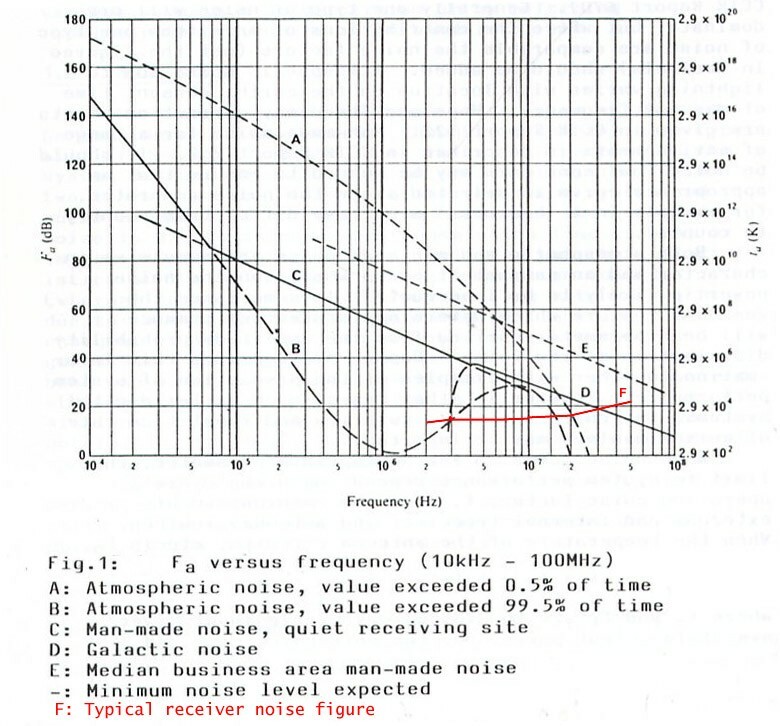 "Reference Data for Radio Engineers", 5th ed., Chapter 27, "Radio Noise and Interference", Howard W. Sams & Co. Inc. I would like to thank Brian Austin GØGSF, and Clemens Paul DL4RAJ, for their valuable contributions to this article. Copyright © 2006 A. Farson VA7OJ/AB4OJ. All rights reserved.